I’m in Southern Sudan for a couple of weeks, writing about the work of the church in the lead up to January’s referendum on independence. These are heady times in some ways, as people long oppressed by the government in the north feel their way toward nationhood. There’s a rocky road on the other side of the referendum, even if Khartoum agrees to honor the results, but for now people are excited about a moment they have long been waiting for. 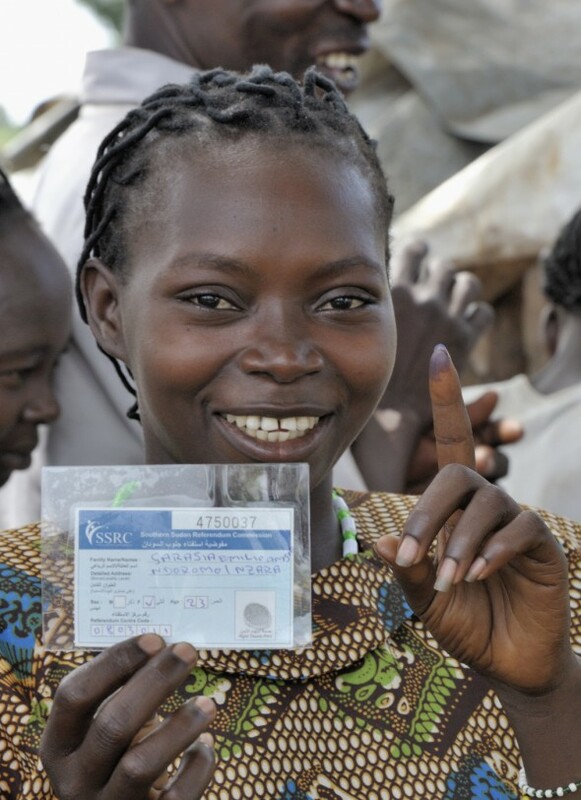 Here’s a woman in Nzara in the very south of the country, near the border with the Congo, who has just registered on the first day of voter registration. She’s got her registration card and her finger dipped in ink. She lives in a settlement of internally displaced people, survivors of attacks by the Lord’s Resistance Army, a Ugandan rebel group that has morphed into an international terror squad, now allegedly at the hire of the northern government. She’s hoping independence will translate into peace, something that the conventional wisdom around here has trouble with, given Khartoum’s propensity to promise and not deliver. 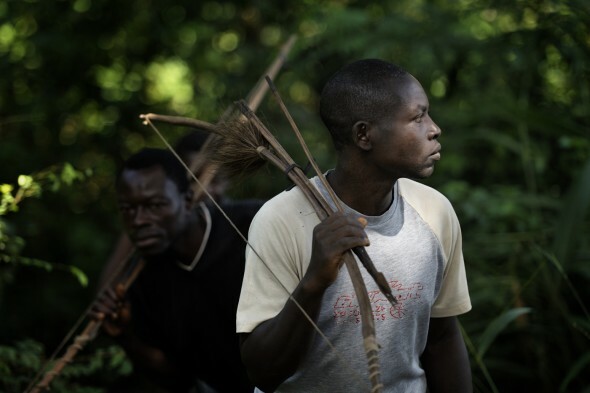 While in that border area I also went on patrol with some “Arrow Boys”, a militia in villages along the border that felt unprotected by any of the national armies in the area, so decided to defend themselves from the LRA with arrows, spears and rusty old guns. There’s a lot of sadness there. I went a couple of times to the Congolese refugee camp in Makpandu, where more than 4,000 people live, people displaced by brutal LRA attacks inside the Democratic Republic of the Congo. I’ll write about all the sad stuff and process the sad pictures. 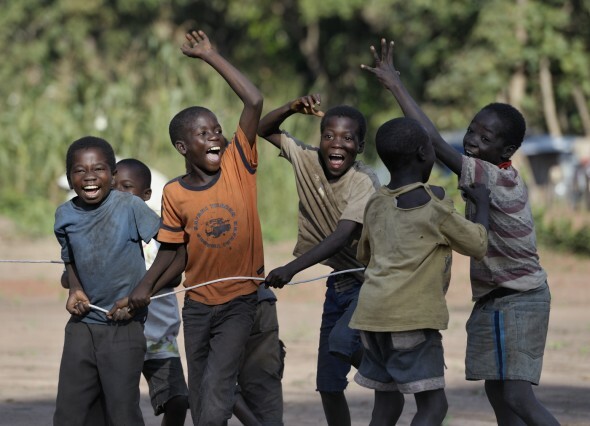 But, to be fair, there’s always life and joy, as simple as a group of refugee boys celebrating a win at tug-of-war. 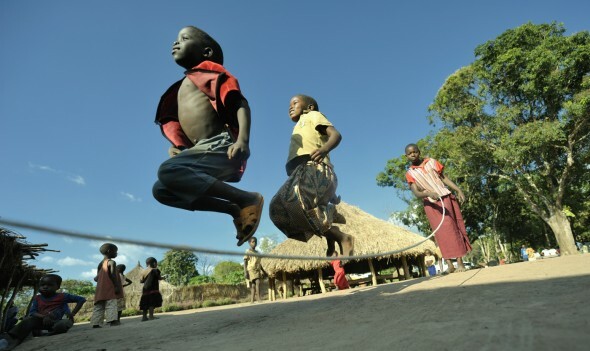 Or jumping rope. The camp has an old Italian priest who lives there. I interviewed him, but since he doesn’t speak English, I asked the questions in Spanish and he answered in Italian. I understood basically what he was saying, but wanted to make sure of the details before I quoted him in an article, so I sent the sound file off over the satellite modem from the jungle along the Congo border to my wonderful friend Don Reasoner in New York, he’s the king of translating, who in turn found a colleague who could translate it into English for me. That’s what globalization, and friends, are for. Speaking of globalization, I’m now in the far north of the country, just south of the border with northern Sudan, in the town of Malakal, staying with a group of Catholic religious organized by Solidarity with Southern Sudan. Good folks. When we gather around the table to eat there are people from Ireland, Canada, Colombia, India, Australia and me. When I stayed in the SSS house near Yambio in the south, there were people around the table from Burma, New Zealand, Vietnam, India and Kenya. I love the sense of shared purpose, the best of globalization if you will, that brings people from faraway places to accompany their sisters and brothers here as they go through exciting but scary times. I also spent a couple of nights around Yei, meeting people from the United Methodist Church there who I got to know last year. I also met Steve and Diantha Hodges, individual volunteers in mission from the United States who are just beginning a community development program with UMC congregations there. Good folks. I spent one night in the village of Pisak, an hour outside of Yei, where I had visited last year. I took back a packet of photos from that visit, and when we arrived there my friend Isaac Sebit, who is from the village but now serves as the associate district superintendent of the UMC in Sudan, passed them out to people. They got pretty excited. Something that many of us in the global north take for granted–seeing ourselves and our families on glossy paper–remains a pleasure unavailable to many in the global south. I need to make that happen more often. I spent the night there in a tukul – a mud hut with a thatched roof. Isaac took me, and he and I stayed with his brother’s family which lives a ten-minute walk into the bush from the nearest road. It was a wonderfully peaceful night under that huge African sky. Here’s Christine Patina warming water over the fire for our bath, which takes place while balancing on a couple of rocks behind a discreet bamboo screen. Christine is the second wife of Isaac’s brother. The first wife, Natalin Konga, lives in the collection of huts right next door. The brother bounces back and forth. Yep, polygamy. United Methodist polygamy to be precise. Although Isaac told me it was frowned upon in the church, and his brother can’t take the sacraments, it happens. And the whole family goes to church together. As if it were Utah. In the morning I woke up refreshed by a night off the grid and walked next door to Natalin’s for breakfast. 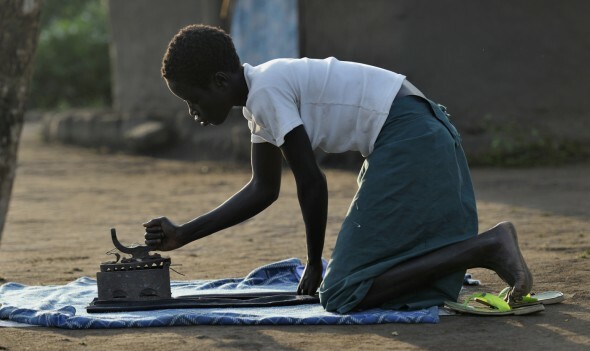 Here’s her 12-year old daughter Charty ironing her blouse to go to school. There are some serious gender inequality issues here to work on, like everything else, once we get passed the referendum, which at this point is pretty all-consuming. Meanwhile, going to school is good. 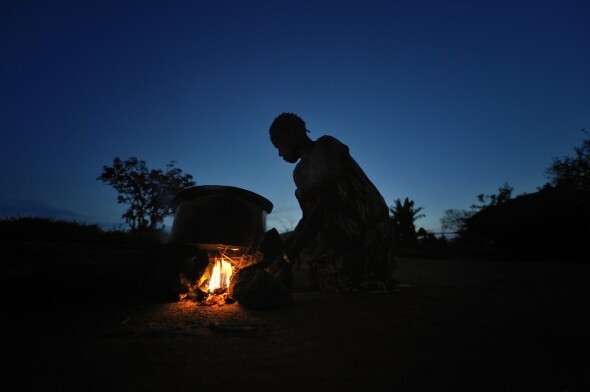 November 21, 2010 | Filed under Africa, Blog, Church, Refugees, War, Women. Thank you for traveling to be our eyes and ears. My husband and I co-lead a weekly peace prayer group in CA which grew out of the UMW Sudan study last summer. We are grateful to share your reports with group members. We all appreciate your positive viewpoint, since many of the news reports seem to sensationalize whatever may be happening.